The book, with its insider, high-level accounts of foreign policy strategy and operations covering much of Obama’s first term, practically puts you in the White House, but, perhaps inadvertently, it also serves as a reminder of the large gap between high level policymakers and low-level analysis/analysts. Specifically, as a former Asia analyst for the Joint Chiefs, it reminded me that academics and the media, even with only limited access to (formerly) classified information, are often better at predicting and spotting new, unexpected trends than those buried deep within government. So much intel analysis focuses on dealing with our software systems, building collections databases, and making link diagrams – all useful at a mechanical, tactical level – that the focus can narrow and turn reactive, missing broader, strategic level developments often apparent to those on the ground overseas … ala some members of the media, academia, and expat business folks. While not an explicit message of Sanger’s book, which focuses much of its attention on how Obama’s team handled its foreign policy “inheritance” from the Bush era wars, the gap between inside intel and outside reporting becomes an easy takeaway. [Book Review] Surprisingly readable – I’d half-expected dense academia or right-wing politicizing (the author is a former Bush administration official), but instead found The Impossible State: North Korea, Past and Future engrossing, with a great overview of North Korea, new insights into the diplomatic make-work program 6-party talks, and solid policy takeaways on the importance of increasing outside information flow into the North. The author pushes a theory, neojuche revivalism (“juche,” itself commonly translated as “self-reliance,” is North Korea’s governing ideology, pg. 410), which seems to have lost some saliency with the death of Kim Jong-il and the changes in personnel and governing structure taking place under his son. According to Cha, the new/updated ideology is a “return to a conservative and hard-line juche ideology of the 1950s and 1960s,” when the North was ahead of the South technologically and economically (pg. 410). Though the theory sounds mildly interesting, North Korea’s opaqueness means it can’t really be tested, nor does it provide much policy-level utility, especially given the ongoing leadership changes. UPDATE (JUL 2015): New images added to the updated blog and Facebook page. I’ll also add a few of the anti-American ones below, the first one is roughly translated as “Those who dare insult our dignity face a mighty punishment!” (it sounds much tougher in Korean). 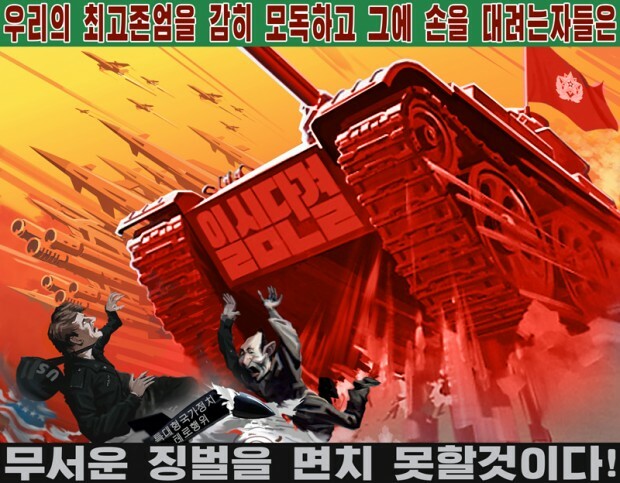 The poster is from the pro North Korean website http://uriminzokkiri.com/ (which itself translates as “our people’s path”). For this one, the headband reads “U.S. military out!” (meaning, leave the Korean peninsula), while the main text reads “Repel the American invader” (to save us from misery and pain). [Book Review] Stunning that a book written in 1958 about Vietnam and SE Asia is still so dead-on accurate. Reading it, you’d never know it wasn’t written last week about Iraq or Afghanistan. A collection of semi-fictional vignettes about Americans working in the made-up SE Asian country of Sarkhan (read: Vietnam), anyone with a hint of overseas experience, or even time working with the U.S. government, will quickly (and in many cases, depressingly) recognize the various archetypes of Americans abroad illustrated here. The authors reportedly based many of the characters on real people they’d met while overseas. A quick bit of Googling sheds light on the origin of many of them. A quick, enjoyable read – whether a story at a time, or the whole book. Highly recommended, especially for those heading overseas, or to DC, to work with the U.S. government and/or military. 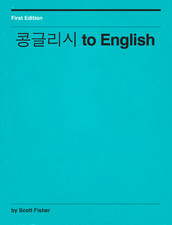 My new book, 콩글리시 to English (Konglish to English), is finally out and available for download from iTunes. 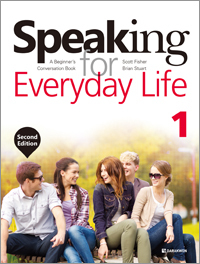 Written partially in Korean, the book is designed to help address common problems faced by Korean learners of English, plus those who teach them. I set up a separate section of the blog, KONGLISH / 콩글리시, to focus on Konglish-related writing, including excerpts from the book. Having researched and written on Konglish since the late 90s, I have a fair grounding in the subject, but am always open to learning more – please post comments below or in a related post. Another goal in writing the book, as I blogged about in the Digital Publishing category (above), was to learn how to use Apple’s new iBooks Author program, and then compare it with Adobe’s Creative Suite, InDesign, and Captivate. While the Apple product, all of six months old, lacks many of the capabilities of the much-older Adobe programs, it also lacks their price (Author is free) and steep learning curve. You can be up and productively writing in Author in minutes (provided you own a Mac – there is, as yet, no Windows version), something that cannot be said for those new to, or only mildly familiar with, the Adobe monstrosities. Having used the product for six months and found it generally user-friendly, practical, and simple, if occasionally buggy and odd (as blogged about in previous postings), I am curious to see what Apple makes of Author. Will it follow iTunes in eventually expanding to Windows? Will Apple allow authors to publish to platforms (i.e. Kindle and Nook) outside of iTunes and iPad? Will Apple finally stop putting that irritating little ‘i’ in front of iEverything iIt iMakes?